Motor vehicle accidents have many causes. One that doesn’t get as much attention as it should is driver fatigue. But that’s starting to change. Calgary Police recently warned that they have seen an increase in the number of collisions caused by driver fatigue. As of early November 2013 they had responded to 96 collisions in the city involving drowsy drivers — an increase of one-third over the previous year’s number. Police point to long work hours as a likely culprit. Rather than getting much-needed rest, many drivers are hitting the road while impaired by fatigue. The results can be tragic. 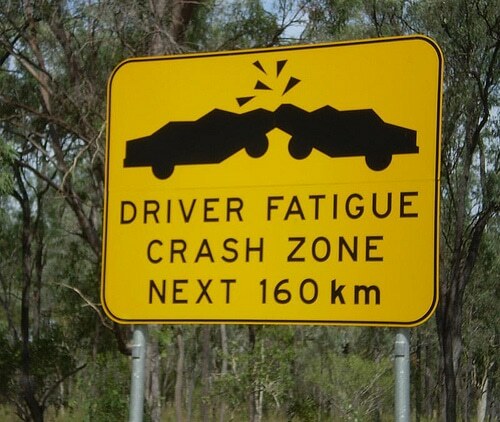 In fact, Transport Canada estimates that 20 per cent of fatal traffic collisions are caused by driver fatigue. About 500 Canadians lose their lives each year in traffic collisions caused, at least in part, by driver fatigue. This is according to the Northwest Territories Department of Transportation. 1) Slows reaction time. This is especially dangerous at high speeds. For example, at 100 km per hour you drive the length of a football field every 3.6 seconds. 2) Decreases awareness. When you’re tired, you’re less likely to see the many obstacles in your environment, including pedestrians and cyclists. 3) Impairs judgment. Much like alcohol, fatigue impairs a driver’s decision-making ability. To learn more about driver fatigue, check out this Driver Fatigue Quiz from the U.S. Department of Transportation.